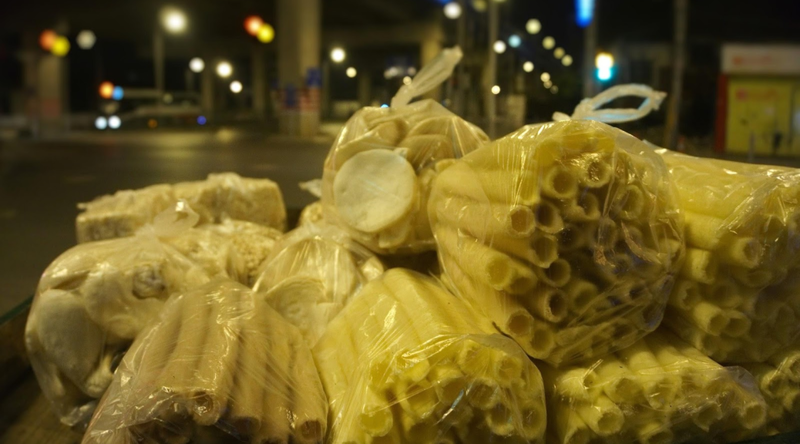 This kind of food can be easily found all around Shanghai, it is sold both in stores and on streets. It originally comes from Sichuan , where it has been enjoyed for couple of centuries. The snack is present in all of China in many forms and variations, which is in a great extent due to the simplicity of its ingredients. The simplest form of 米花糖 (mǐhuǎtáng), where rice is mixed with dissolved sugar. It costs only 10 yuan per pack. The pack contains around 350g. Price might vary depending on the ingredients. 米花糖 has many variations. The simplest kind is made out of white rice to which sugar dissolved in water is added. The flavor of the snack can be modified depending on what ingredients are used and in which quantities. Some people like to add oil, dried fruits, honey or nuts on top of sugar. Before any other ingredient is added, the rice must be puffed. The two most common ways are deep frying or dry puffing, which is done with a “popcorn machine” (爆米花机 bàomǐhuājī). The rice is fried in a scalding hot oil; it takes from 15 to 25 seconds for rice to puff if the temperature is right. The “popcorn machine” is mostly seen on streets. While using this machine is a healthier way of puffing rice, the temperature and the pressure of the cylindrical metal container must be kept under control. The metal container is constantly rotated, while heated by burning coal. The act of rotating the container helps evenly distribute the temperature inside. Because the container is sealed, the pressure inside rises with the increasing temperature. When the rice is puffed and the container is opened, the pressure creates a small explosion and the rice bursts into a “bag” placed over the container. Puffing rice with the “popcorn machine” takes between 8 and 10 minutes. Puffed rice is mixed with sugar that has been dissolved in water, then cut into small brick like pieces. One can add dried fruit pieces or nuts on top of sugar. Cutting the mixture is usually done on a lower temperature, where the sugar creates a stronger bond between rice grains. 米花糖 is believed to come from Sichuan Pujiang. Traditionally 米花糖 that comes from Pujiang is made with lard oil, which gives it a characteristic taste and aroma. 米花糖 was first recorded during the Qing dynasty, around two hundred years ago. Nowadays 米花糖 and its variations can be found even in Hong Kong, where it was brought during the Japanese war. In the beginning of 2007 a 米花糖 Museum has been opened in Pujiang, Sichuan. It is the first and the only museum that focuses on 米花糖.